By 2018, VW wants to sell 800,000 vehicles in the United States. Volkswagen says it has enough dealers to triple U.S. sales by 2018. Here are some facts about VWs dealer body. Everything about Volkswagen AG's goal to more than triple U.S. sales by 2018 is ambitious, down to the plan of reaching it with roughly the same dealer body it has now. For VW's more than 600 dealers, the plan is a work in progress. But VW has no plans to add numerous dealers on its march to 1 million U.S. sales, or to leave any behind. "We want to really work with the dealer body that we currently have and get them to grow, both in sales and, of course, profits," says Mark Barnes, COO of Volkswagen Group of America Inc. "That will help us get to this number versus going out and putting dealers on every corner." VW's U.S. management team recently finished a round of all-day dealer meetings in the brand's four sales regions. The level of investment that will be expected from dealers to meet a goal still a decade away was not high on the agenda, says Jason Kuhn, of Kuhn Volkswagen in Tampa, Fla.
"Right now the primary focus is on getting through this short-term economic downturn and to focus as much as we all can on dealer profitability," says Kuhn, incoming president of VW's National Dealer Advisory Council. Within two to three years, he expects dealers will have to revisit the capacity of their stores, looking especially hard at their service capacity and whether it can handle the projected increase in volume. "There may have to be some additional financial commitments made by dealers," Kuhn says. "But all in all, I think that these are good problems to have. And there are certainly a lot of brands that are projecting shrinkages in their sales in the next eight to 10 years." By 2018, VW wants to sell 800,000. Audi sales will push the automaker's total to 1 million. In 2008, VW brand sales in the United States fell 3.2 percent to 223,128. The total U.S. light-vehicle market fell 18.0 percent. That's a long way from 800,000. But COO Barnes says VW doesn't expect its dealers to get there overnight. Management has set a "midpoint milestone" of 500,000 units within four to five years, he says. "We're going to be cognizant of what's happening in the market," Barnes says. "I said 500,000, but I didn't say by when. I said the next four or five years. It may take six years. We want to make sure we're realistic in what the expectations are." A team at VW's new offices in Herndon, Va., has identified six key areas to reach 500,000 units, Barnes says. First is dealer development, followed by brand development, customer service, corporate organization, pre-owned strategy and distribution. Much remains to be done. But Barnes says an initial review of VW's stores reveals a staffing issue rather than a brick-and-mortar one. For the most part, the service departments are in line, he says. Some will have to expand, but the larger challenge will be getting technicians. 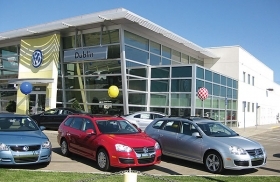 VW recently completed an extensive survey of its U.S. dealership locations. "It's very few areas of the country where we're going to be looking to add dealerships," he says. Despite the current market, Kuhn says he doesn't think VW's targets are unrealistic. At the height of VW's sales in the United States in the 1970s, he says, the brand sold about 500,000 vehicles with about the same number of dealers it has today.